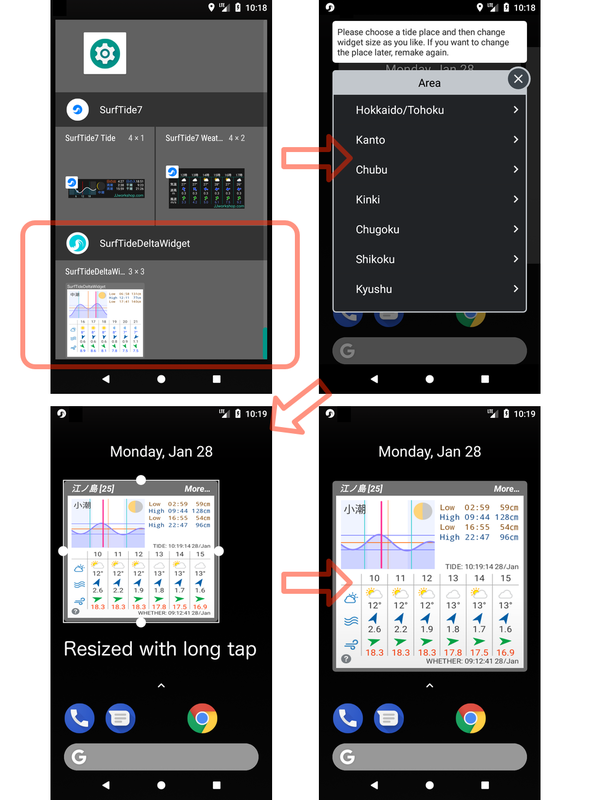 This is manual of ‘SurfTideDeltaWidget for Android’. 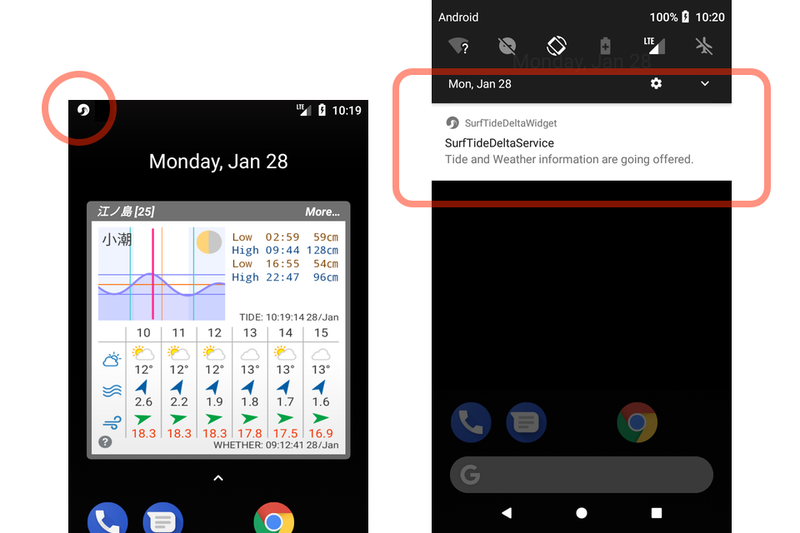 SurfTideΔ for Android widget is installed separately from the app. To use this widget please install from the following. If alredy installed, you can select “SurfTideDeltaWidget” from the device’s widget list and add it to the home screen. After the addition, a dialog for selecting the place is showed and then you can adjust the size of the widget as you like. Recommend a size of widget that is as close to a square as possible. You can be registered multiple widgets. Once you register the place of widget can not be changed. To change the place, please delete the target widget and add the widget again. This widget regularly updates content using service of Android. The service starts automatically, but the OS may be killed the service on the status of the device. This widget updates the contents automatically every 10 minutes for tide, and every 30 minutes for weather forecast . Also it automatically updates even when you turn on the device screen. While turn off the device screen, all updates are stopped. For the weather forecast, the widget uses the latest cache of the weather server. So, the update time (WHETHER: ) shown in the widget depends on the cache of the server. Weather forecast content update may be delayed from several seconds up to 1 minute depending on communication status. If it is displayed as “N/A” and it does not update after tapping please wait for a while and show it again. By tapping “More …” on the upper right of the widget you can launch the app version of “SurfTideΔ”. If “SurfTideΔ” is not installed, you can launch and install the Google Plain store. The weather forecast contents are as follows from the top.